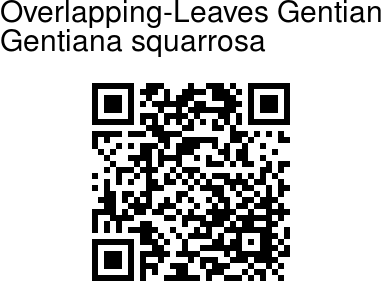 Overlapping-Leaves Gentian is an annual herb 2-8 cm tall. Stems are ascending, branched throughout, densely dotted. Basal leaves are withered at anthesis, leaf-stalk 1-2 mm, densely dotted. Leaves are ovate-elliptic, ovate, or ovate-round, 6-10 x 5-9 mm, base narrowed, margin thick cartilaginous and ciliolate, tip blunt and cuspidate, midvein distinct. Stem leaves are recurved, spoon-shaped to obovate, 4-7 x 1.5-3 mm, base narrowed, margin thick cartilaginous, tip rounded with a fine needle-like point. Leaf-stalks are 2-8 mm. Sepal is obconic, 5-8 mm, sepals recurved, ovate to ovate-orbicular, 1.5-2 mm, base narrowed, margin thick cartilaginous and densely ciliolate, tip pointed, midvein prominent. Flowers are blue, tubular to funnel-shaped, 7-10 mm, scarcely protruding from the sepals, petals ovate, 1.5-2 mm, margin entire, apex blunt, false-petals ovate, 1-1.2 mm, margin entire or toothed, tip blunt. Stamens remain inside the middle of flower tube. Style is 1-1.5 mm; stigma lobes broadly oblong or semiorbicular. Capsules are narrowly obovoid to obovoid, 3.5-5.5 mm. 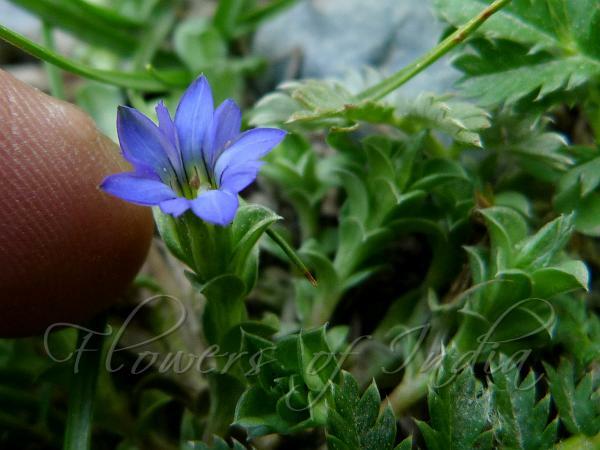 Overlapping-Leaves Gentian is found in NW India, Kazakhstan, Korea, Kyrgyzstan, Mongolia, Nepal, Pakistan, E Russia, at altitudes of 100-4200 m. Flowering: April-September. Photographed in Nubra Valley, Ladakh.